1. I was interviewed yesterday about blogging and branding and being a writer over at Katherine Amabel's blog. You can read me espousing all kinds of... er... wisdom *cough cough* here. 2. Cally Jackson's book has been on the market for a month now and she's pulling back the self-publishing veil here. 3. My dearly beloved tweep, Kathryn Rose, GOT AN AGENT! (And a mighty find agent too, I might add, in a totally unbiased manner....). You can read her story here. 4. And if all that wasn't enough, PITCH WARS is ON! Choose your mentor, get good, and find yourself an agent without having to go through the rigmarole of querying. If you're an unagented author, do it. Now. (And if your book is right for them, pick my agent sister, Molly, here or my awesome CP, Sharon, here). Your Turn: What else is going on out there that I want to read about? Link it in the comments! Today I want to know: What, in your opinion, really makes a winner in this industry? We always hear "just keep writing" and "don't give up! ", but there's got to be more to it than that. If you have an agent or (hallelujah!) a publisher what's the key advice you took that got you there? If you self-published and gained a solid readership, what do you think pulled your book out of the cyber-sea and into the sun? However you define success, what is the key advice you're taking to get you from here to that elusive contract / publication date? How Good Writers Make You "Feel"
For years there's been something bothering me: Why is it when I read a book that's been professionally written / edited (well), am I transported more than by a book that... isn't? Writers whose work compells me to keep reading don't describe "the feeling" of the focal character, they describe the stimulus that creates the feeling. It means no more "Before me stood the most delicious example of masculine strength under God's blue sky. I could barely breathe, unable to take my eyes off him..." and lots more "When his head turned, the sharp blue of his eyes raked me from head to toe. I shivered, following the lines of his broad shoulders to the corded muscles of his back..."
Rather than "John wasn't in New York when Samantha was killed? He could be the murderer? My entire body trembled. I sucked in a breath, unable to believe it could be true. John had lied to me! John could be the killer?! No!..." you'll find more of "John wasn't in New York when Samantha was killed? I knew I should speak. Deny it. But all I could see was her bruised and twisted body, lying naked in the sand, cold and alone. The way her hair twisted around her ear and stuck to the raw skin on her neck. The numb vacancy her death had left in my gut. Was it possible he'd done that? Was John that monster?" Instead of "Rafe took my hand and finally, finally I let myself smile. Drowning in the deep pools of his eyes - the eyes I'd wake up to every day for the rest of my life. My heart raced as I drank in his handsomeness and strength..." you'll find, "Rafe took my hand, his fingers curling between mine. It was the moment to let myself smile, and I did, dropping my head to rest on the warm firmness of his shoulder and breathing in the scent of him - pine, musk and something uniquely Rafe. As the car roared to life my smile broadened. We would drive away and never return to this place. This house was not a part of our future. Only our past..."
I guess the biggest lesson I'm taking away is that a focus on the feelings of characters will still get your story across. You can write a book that "shows" and describes feelings, and sometimes readers will love it. But the book that places the reader in the skin of the protagonist, allowing the reader to see, feel and think as the character, trusting the reader to draw the right conclusions... that's the book that I forget I'm reading and just experience. That's the story that becomes my own. Your Turn: Have you observed any patterns or techniques in the books that draw you in and capture your imagination? There's no doubt, reading a book and writing one are two very different experiences. And there's no doubt that being a good reviewer / critiquer doesn't necessarily make you a good writer. Whenever I talk to a writer who says they don't have time to read, or who disdains every book in their chosen genre, alarm bells ring. If you don't read other writers in your genre, how do you know what works and what doesn't? If you can't take the time to read and appreciate material from those who have achieved something like what you're aiming for, what are you measuring against to know you can do it better? If you can't find something good in a popular book that so many readers enjoy, how can you be confident that your book will attract readers too? Seems to me, we need to learn from those who've gone ahead before we can surpass them. Even a poorly written popular book must have something within it to attract so many readers. Would it hurt to take a look and try to figure out what that is? It can be useful to analyze other writer's books, both to learn and to identify flaws we want to avoid. And, perhaps most importantly, sometimes we can learn how to be better story-tellers by reading other authors' work. Sometimes someone else actually does know better - and you can benefit by being influenced by them. I'm not suggesting we should be writing books that are derivative of what has gone before. But I am a firm believer of standing on the shoulders of others, especially when we're relatively inexperienced. Maybe the key to your current plotting problem is evident in the latest dystopia. What if the inspiration for your next protagonist is hidden behind the cover of one of the classics? Or the voice that will show you how to unleash yours is rolling off the pages of a self-published work? If you don't read, how will you ever know? Your Turn: Does your writing benefit from reading? Why or why not? I have been interviewed by YA fantasy author, E.M. Castellan! She asked me about everything from critiquing for writers, blogging, the book that landed me an agent, and more. You can find her blog and my interview here. Elizabeth Briggs calls herself "...a nerd who writes YA sci-fi, goes to Comic Con every year, and volunteers with dog rescues." (I just call her a lovely online-friend and source of insightful publishing advice). She's represented by Kate Schafer Testerman of KT Literary, and interns for Jill Corcoran of the Herman Agency. Liz, thanks for taking the time to drop by today. Let's start with your position as Intern at the Herman agency. How did you procure that position, and what's involved? Thanks for interviewing me! I got the position by sending Jill an email after she posted that she was looking for interns. I told her I didn't have any experience in publishing, but that I was an active member of SCBWI and an avid reader of YA and MG. I wrote that I was hoping to transition to a job in publishing, and tried to describe how my work experience gave me skills that would help me as an intern. I honestly didn't think I would get the position because I assumed most people would be better qualified than me, but I wanted to try anyway. Jill ended up hiring someone else as her assistant, and I figured that was that. But few months later Jill needed another intern to help with the growing query pile and contacted me. She interviewed me over the phone, and I started working for her in June. Now I help her go through queries, both to reject the ones that are obviously wrong for her and to make sure she pays attention to the amazing ones. I also sometimes read full manuscripts and give my opinion on them. That sounds really interesting! Had you had much experience reading other writer's manuscripts before you started? What are the most common flaws you see? Nope! The only experience I had was reading published books and doing critiques for beta readers. But I think one reason Jill "hired" me was that I've read over 90 books a year for the past few years, and most of them were YA and MG. The most common flaws I see in manuscripts are: too much backstory early on, passive main characters, and a plot that moves too slowly. That's interesting that you mention passive main characters as a common flaw. The word "passive" gets bandied around a lot in writing circles, but I think sometimes as writers it's hard to see your main character in that way when you know everything that's happening inside their head. Can you offer some examples of the kinds of things that make a protagonist passive, in your opinion? A passive character is one that isn't driving the plot forward. Often this is because the protagonist doesn't have a clear goal they are working toward, or sometimes other characters are making the decisions and taking action instead of the protagonist. To fix this, I'd suggest making sure your main character has an overall goal they are working toward, plus a smaller goal or desire in every scene (although they should often fail at reaching these goals - it's the trying to achieve them that matters). You can also look at your side characters and see if one of them is making all the decisions, rescuing the protagonist a lot, and so forth (in YA, I often see this with the love interest). Since you're reading a lot of different books now, from different authors, do you find yourself drawn to any genres in particular? Or seeing any trends coming through that you're excited about? I'm not really drawn to any genres in particular, I just look for a unique concept plus excellent writing. And I wish I knew what the upcoming trends were! Right now I'm seeing a lot of interest in YA mystery/thrillers, funny contemporary, and magical realism. Also, anything MG is in demand right now, but it's hard to find writers who can do a great MG voice. Great insight! Excuse me while I scurry off to finish my YA thriller! *Cough* Now that you're settling in with Jill, have you found that reading all those queries and books has helped you as a writer? It's definitely made me a better writer, probably because it's easier to see what works and what doesn't in other people's writing than in your own. It's also helped me be more aware of overused cliches in writing (starting with waking up, for example). Is there any advice you'd offer to writer's heading into the query / submission fray? My advice to writers is to do your research before you query, not just about submission guidelines and things like that, but also about the agent him/herself. Look at their sales, and not just how many there are, but also where they've sold to, and what types of books they've sold. For example, if an agent only sells adult mysteries, or only sells to small presses, does that work for your book and your goals? If the agent is newer, where did they previously intern or work, and do they work for a reputable agency now? If they have Twitter or a blog, do you like what they have to say? Do you like their clients' books? I think writers sometimes become desperate to get an agent and don't stop to think, "Is this person a good agent for me?" You want to make sure that the agent you sign with both has the right experience for your writing goals, and is someone you want to work with for many years. That's all great stuff, Liz. Thanks so much! Now, as our final farewell, tell us about your book! Where are you in the process of finding a publisher? And where can readers find you if they want to message or tweet, or hear about your upcoming success? I'm represented by Kate Testerman of KT Literary, and my novel ALTERNATE is about a teen hacker who is thrust into a war between parallel universes when she meets an alternate version of herself from another dimension. You can find me at http://elizabethbriggs.blogspot.com and on Twitter at @lizwrites. Thanks for the interview, Aimee! Your Turn: Do you have any questions for Liz? A little over a year ago, Aimee allowed me to give a lengthy account of how I came to sell my debut YA Thriller FAKE ID (formerly WHISPERTOWN) to HarperCollins. She and I chat often on Twitter, and I asked if there was anything her readers might be interested in hearing about post-sale? She barely hesitated when she said, "The editorial process". *For the purposes of this post, I’m going with a broad interpretation of “editorial”, meaning everything that me, my editor, and my agent deal with jointly, not just the specifics of manuscript revisions. All of it is intertwined. Also, since the timeline aspect of my last post seemed to go over well, I’ll stick with the familiar. *Because I’m giving you my in-the-moment experiences and reactions, some things may seems less than positive because that’s how it felt at the time. Let me be clear, I work with AMAZING people in this industry. I’ve gone on at length in other forums about my incredible agent, and I need to extol the virtues of my editor, too. My book is a better book because of their guidance. By telling you of various delays that occur when you’re a debut writer, I’m not indicting anyone. I simply want you to understand that every part of this process is a SLOW GRIND that you have very little control over. When it’s your turn, be prepared to hurry up and wait. I get the first half of my advance. My wife takes a picture of me holding the check in a Heisman pose. (I’m not going to show you the picture.) With this money comes a set of dates that I’m contractually obligated to meet. My next draft of WHISPERTOWN is due on 1/23/2012. My editor expects to give me revision notes sometime in November. That means a two-month turnaround. Intimidating, but I’m a pro and I’m ready. My birthday comes. I’m 32, and I realize that by the time my novel debuts in summer 2013 I’ll be 33 and a half (or so I think). Wow. Seems far and close at the same time. I enjoy a good dinner and some cake with my family while mentally preparing to meet my writing obligations. My Edit Letter will be coming any day now. No Edit Letter yet. My agent assures me this is normal. “But, what about that date in my contract, the one that says I have to turn in a new draft in January or legal armaggedon will come to pass?” My agent says, “Lamar, I’m pregnant, and the baby is, like, tap dancing on my kidney right now. We’re fine, and I’m going to make sure I don’t have any internal damage. More soon.” Really, that’s not what my agent said, though she was pregnant at the time. She let me know that the dates in contracts are flexible because things change on a dime in publishing. Fair enough. Less stress during the holidays. My contracted revision deadline comes and goes. I’m not overly concerned because my agent told me this was normal, and many of my writer friends are experiencing similar shifts in their revision dates. I’m lying if I say I’m not a little annoyed about the delays, but what can be done? *No one likes waiting, but good notes from a good editor are worth the time. Maybe twice in my career, I’ve heard a writer say their editor got back to them quickly and had no notes because their manuscript was perfect. It’s great if that works for those scribes, but I’d probably have a panic attack if my editor gave me no notes. I’d think they either don’t care, or the manuscript is SOOO bad it’s not even worth the effort of small improvements. It’s better to wait than rush here. If you’ve experienced a layoff (I hope you haven’t, but if you have…) you may understand how devastating/humiliating/depressing the process can be. In his memoir ON WRITING, and to a greater extent, in his novel DUMA KEY, Stephen King posits that there is healing power in art, writing and painting respectively. Now I have a reason to agree with him. As hard as it is to lose my job, there’s comfort in knowing I still have work to do. Also, I learn a humbling lesson. My annoyance at the shifting dates was unjust. If I’d gotten my revisions any sooner, I wouldn’t have had the divinely timed comfort of getting my first set of editorial notes on the same day my company gives me a pink slip. If I’d gotten them any later, I would have undoubtedly suffered from the anxiety of being unemployed AND in publishing limbo. Everything happens when it’s supposed to. This is a lesson I have to remind myself of in May when I get more news I’m not really enthusiastic about. Have a 2-hour call with my editor to discuss my long-form Edit Letter (9 pages, single-spaced…YIKES!) and how I will tackle WHISPERTOWN revisions. It’s a great talk overall, but there are moments of panic and sadness. Panic – My editor feels I need a major rewrite due to a pacing issue. Two primary characters only know each other for a week in the original draft. They need more time together to justify later events. The expansion of this relationship sends ripples through the ENTIRE novel. There’s no way to cut and paste around this (not that you should ever do that anyway—maybe more on that in another post). This is just ONE change. Remember, my letter is 9-pages long. Sadness – Due to my shifting revision dates, it’s almost guaranteed that WHISPERTOWN will not be done in time to make a Summer 2013 release. And Fall 2013 is a tough time to break out debut authors. Winter (Early) 2014 is looking like my window. This is the part where I have to remember the prior month’s lesson. Everything happens when it’s supposed to. My new revision deadline is 07/31/2012. I get my attitude in check and get to work. I get a new day job. It’s a blessing. Not even unemployed a full 2 months. A bigger blessing, because the first few weeks at a new job can be slow with orientation stuff, I’m off by 5 every day with plenty of time and energy to rewrite WHISPERTOWN in the evenings. New day job is picking up, but I still beat my WHISPERTOWN deadline by 2 days. It’s a good month. I’m told to brainstorm title ideas. WHISPERTOWN is going away. I’m not surprised. Based on previous conversations over the last 14 months, I know HarperCollins wants to call the book something else. I’m cool with that, though I can’t seem to come up with anything that POPS. I find I have a knack for truly terrible titles, though, to the point that my wife and I make a game of inventing bad ones. No, I’m not sharing. My editor comes up with a title that is both obvious and perfect…I’m ashamed I didn’t think of it myself. WHISPERTOWN becomes FAKE ID. And, she’s pleased with my revision. Great news. Of course there’s still some tweaking to do, which is customary, but no more complete overhauls, which is splendid. I’m told there may be an opportunity to write a prequel short story for FAKE ID, start thinking of some ideas. The day job is hectic all-consuming this month, but there’s always time to plot during coffee breaks! The month just started, and I’m sharing my story with you great folks. Life’s good and I’m thankful for you and Aimee. The journey continues…for all us. Your Turn: Does Lamar's story include any surprises for you? If you have any questions for Lamar, you can ask them in the comments below, or on his twitter / facebook profiles. Writing (and subsequently publishing) The Big Smoke has been an incredibly long journey – eleven years to be precise. It’s been a fantastic learning experience, and I feel that my writing has improved so much over that time. But the main reason for that rests with one important decision I made many years ago. Rewind to 2007. I had a complete, polished draft that I was immensely proud of. It had taken me seven years already to reach this point (with a number of stops and starts long the way), and I was ready to send my masterpiece out into the world. Despite what everybody said about how hard it was to get a publishing deal, I secretly believed that it wouldn’t take long for an agent or publisher to recognise my writing brilliance. Then I came across an advertisement for a manuscript appraisal service. The service promised to answer the question, how good is your manuscript, really? Their website said that if your manuscript was ready for publication, they wouldn’t hesitate to tell you, but if your manuscript still required work, their appraisal would outline in detail what areas needed improvement. I thought about it for a while and decided that it sounded like a worthwhile investment. I’ll be honest and say that I expected an appraisal report that gushed over my writing ability and confirmed that my manuscript was ready to be published. The report I received was ten pages long and detailed several areas of my manuscript that could be improved. Reading that report was like being slapped repeatedly across the face. I quietly closed the document and didn’t say anything about it for quite a few hours (which is a record for an over-sharer like me). It took me a few weeks to build up the courage to read the report again. The second time, it didn’t hurt quite as much, but still a fair bit. Did this mystery assessor really know what she was talking about? Perhaps I should just delete the report and pretend like I’d never read it? Because the story moves so fast, and there’s so much going on, there’s no space for you to pause and delve into your characters’ emotions and responses, etc. At present you skim the surface of who these characters are (and who they come to be), so we don’t get to know anyone in any great depth. The tone of this MS was one of the main things I had concerns about, and I kept wondering as I read what the best tone for this would be… I don’t think you need to have too dark a tone, and a light tone is fine. However, it needs a bit more sophistication – it’s a little too like a soap opera at the moment, and a little too twee. A more sophisticated tone is particularly important if you stick with the university setting. Unfortunately, despite all of the work I’d put in to date, it seemed that I still had a lot further to go if I really wanted to make my manuscript all it could be. As a result of the appraisal, I decided to completely rewrite the manuscript, streamlining the plot and changing the narration from third person to first person from two perspectives (my two main characters). I felt that these changes would address the crux of the issues that the assessor identified – limited character development and a narrative style that didn’t suit the content. That decision was the best I’ve ever made for both my manuscript and my writing in general. It propelled me to study other books (fiction and writing craft) and learn how to develop rich characters and establish an authentic voice. The re-write took four years, and I considered giving up on many occasions. But, finally, I reached ‘The End’ for the second time. · The way the book reads, it is as though Ceara and Seb are telling me (the reader) their stories over coffee and that's a great achievement for you, Cally the writer, as I am hearing their voices not the writer/narrator intruding. Well done. · The characters feel very real for me and I'm invested in what happens to them. · Because you are telling the story from both Seb and Ceara's points of view, the reader gets into both their heads and it gives an almost voyeuristic POV. The reader is in on it all and privy to both main character's innermost thoughts. It feels real and immediate and took me back to those days of feeling insecure and uncertain what was expected of me (and that was a rather long time ago so well done Cally). · I think you have really nailed both voices. They are realistic and most engaging. · My first reading I stayed up late as I could not go to bed without finishing it; that was how absorbed I was in both their stories. · They definitely have distinct voices in both personality and gender. Their inner narratives drive the story. After reading these comments, I was satisfied that I’d achieved my goal. Hooray! It only took me four years! ;) But if it weren’t for that initial appraisal, I never would have known these issues existed in the first place, and I wouldn’t have had the opportunity to challenge myself and grow as a writer. So what’s the moral of this (slightly long-winded) story? Get feedback. Professional feedback. You don’t necessarily have to pay for an appraisal like I did, but don’t take the word of your friends and family who would love anything you’ve written regardless of its actual quality. I’m so glad I got that appraisal and decided to act on it. Hearing the truth about my writing may have hurt, but it was worth it in the long run. in e-book format from Smashwords (preferred digital supplier), Amazon, iBooks, Kobo, Diesel and other e-stores. Your Turn: Have you had any major wake-up calls with your writing? What have you done to make sure your work really is ready for the world? Swearing in YA Fiction - Authentic? Or Gratuitous? I've avoided writing this blog for a while because it's another one of those subjects people tend to feel quite strongly about. But the issue has risen (again) in my current WIP, so I'm ready for some dialogue (no pun intended). Here's the down and dirty: Teenagers often swear. Lots of teenagers swear a lot. It seems to me, if we're depicting teenagers in a contemporary society, swearing isn't just likely, it's actually hard to avoid. Hmmm.... I'm not so sure. Don't get me wrong, I know swearing is a part of daily life for teenagers, even if they choose not to do it themselves. But the question I keep asking myself is, do I need to add to the cacophony? The reality is, there's so much out there that kids have to deal with, so much they have to filter and figure out, do they really need one more book adding to that picture? Does swearing add authenticity? Or does it just lean on uneducated tropes? For me as an author, the battle is how to effectively communicate anger, frustration and (to a certain degree) surprise in teenagers without dropping f-bombs or jumping on the beeyotch train. And there's another layer to this debate that I haven't seen addressed at all: One person's swear-word is another person's fluff. I've grown up travelling between (and learning how to communicate in) two very different english speaking cultures. There are words I can say in New Zealand without blinking that would have my American family reaching for the smelling salts. And there are words I could say in America that would be laughed at, where most New Zealander's would take offence. This is because culturally the impacts of the words are different. So, if I'm being careful with my language, where do I draw the line? Which country's vernacular is acceptable? What level of swearing denotes authenticity, and what level is simply gratuitous? Of course, there are always the phrases Carl swore under his breath. A happy medium, if you will. And effective. But not always applicable - especially in a passage of actual dialogue. I usually find myself typing swear words in my first drafts, then removing them later, either with something I deem more clever, or just deleting it altogether. At this point my goal is not to add to the cacophony. But that's because I don't swear in day-to-day life. Ergo, I choose not to write them, either. Is avoiding the issue akin to pretending it doesn't exist? At what point am I giving the finger to the good manners my mother taught me? And at what point am I disappointing readers by failing to accurately depict their world? I don't want to spark off a moral debate, but let's be honest, our opinions on this type of issue tend to fall fairly closely in line with our personal choices. As an author, is it my job to "sink" to the level of the sixteen year old who'll read my book? Or is it my job to show them (without preaching) that there's another way to do this? Okay, cyberspace, I'm ready to hear what you have to say. But this blog is still PG rated, so please refrain from using actual examples, if possible. 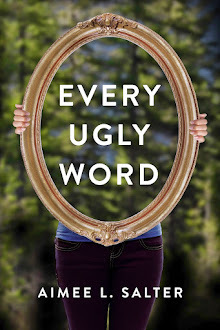 Your Turn: Should contemporary YA books include swearing? Why? Or why not?